Authorities in Hawaii have warned of dangerous “laze” fumes as molten lava from the erupting Kilauea volcano reached the Pacific Ocean. 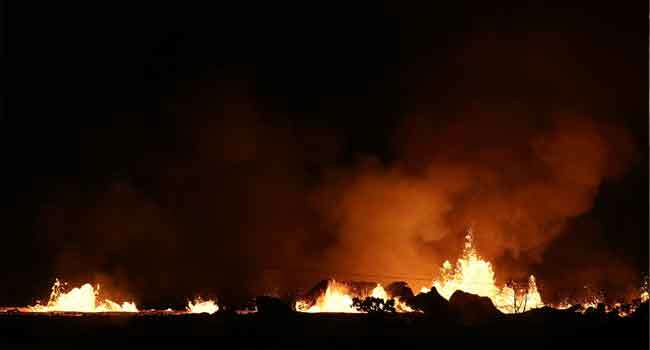 Two lava flows “reached the ocean along the southeast Puna coast overnight,” on Hawaii’s Big Island, the US Geological Survey, which monitors volcanoes and earthquakes worldwide, said in a statement Sunday. A crack however opened in the ground under one of the lava channels, “diverting the lava… into underground voids,” the statement said. When the hot lava flow hits the water it produces acid fumes known as “laze” – lava and haze. “The plume is an irritating mixture of hydrochloric acid gas (HCl), steam, and tiny volcanic glass particles,” the USGS said. Moderate winds mean that areas downwind from the volcano “may experience varying levels of vog,” or volcanic smog, a haze created when emissions react to oxygen, moisture, dust, and sunlight, the USGS said. One giant lava flow grew to 20 feet (six meters) in height and blocked a portion of Highway 137, seriously impacting area residents, Hawaii News Now reported. Kilauea is the world’s most active volcano and one of five on Hawaii’s Big Island. Scientists believe the volcanic activity may be a precursor to a major eruption similar to the one that shook the island in the mid-1920s. But they say they expect no loss of life given that the most exposed residential areas have been evacuated and the region where the volcano is located — on the southeastern part of the island — is lightly populated. Authorities have warned residents to stay away from the evacuated neighborhoods, warning that toxic sulfur dioxide seeping out of nearly two dozen fissures could prove deadly.